Christmas is just around the corner, and if you want to craft a Christmas card but have yet to do so, don’t worry, there is still time to take a great family photo to send to your loved ones. When it comes to family photos, it never fails; we are constantly coming up on holidays or events where we wish we had planned to get a professional portrait taken. Over the years, we have found that it just works better for us to do them ourselves. Here are 10 tips that help make our family photos better. Location. This is probably the most important element in the photo. Make sure it is picturesque. The background could be a simple brick wall, a big red barn, an open field, a bridge, but whatever it is, put some thought into what the picture will look like in its entirety. Remember to check the background for less desirable objects such as garbage cans or plastic lawn furniture. Lighting. If you do not own or have access to appropriate lights, head for the outdoors. Weather will be the biggest factor. Avoid the bright sun; plan for an overcast day or go for the shade. Time of day makes a difference, too; morning or late afternoon are going to provide the best angle of the sun. Tripod and Remote or Timer. A tripod is very important if everyone will be in the photo, and assuming it is a family photo taken by you, this will be the case. Attach a remote to your camera or position everyone as desired. Then one person sets the timer and makes a run for it. Have the spot for the photographer planned ahead of time, so he or she can just slip right in. Look at the Camera. When kids are little, it might help to attach a stuffed animal or toy to the top of the camera. They may be more likely to focus on something they are interested in than the camera itself. This is one strategy we used regularly when our kids were little, and it works! Still (Formal) Poses. Pinterest is always a good place to get ideas for how to arrange your family. If you are doing still poses, you don't want any two heads to be at the same level. Subjects may need to sit, stand on something, or be held by a parent. Candid Photos. Keep in mind that photos do not have to be a group sitting or standing in one spot. Holding hands while walking toward or away from the camera, or looking at each other and chatting or laughing are a few examples of how you can mix it up. Especially if using a remote, the family can interact naturally while the camera snaps away. Clothing. Whether you like to coordinate or match, own it. When our two boys were little, I'll admit, I liked matching outfits. I still love those photos. It wasn't long until they didn't want to match any more. Around that time, we added our first girl and then another. So, coordinating outfits became necessary. You can choose a palette of colors to mix and match. I like to do mostly solids in different shades and throw a pattern or two in there to keep it interesting. Rewards. Some call them bribes, but sometimes, you've got to do what you've got to do! Family photos are important! When our kiddos were really little, a jellybean for every good photo did the trick. As they got older, the rewards seemed to get bigger until now, for our 13-year-old, the best reward for being cooperative is being finished sooner. Breaks. Don't be afraid to take breaks. 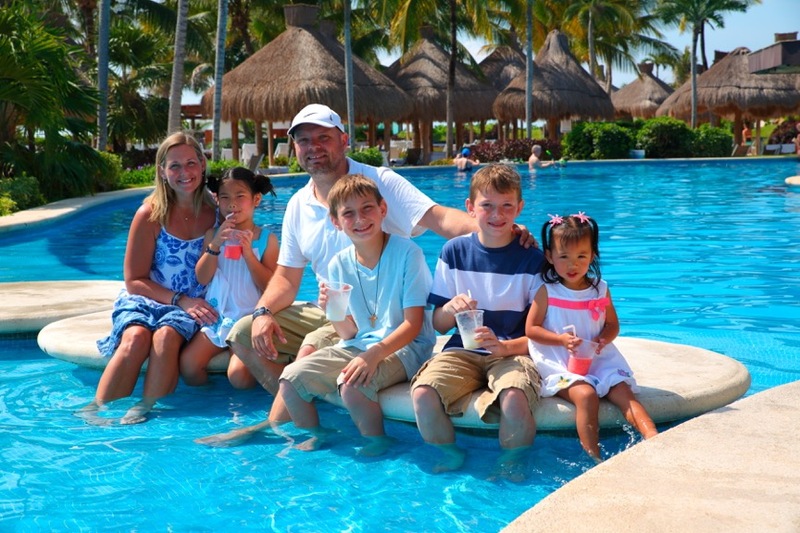 One of my all-time favorite family photos is when we were in Mexico. We'd been shooting all morning, and the kids were hot!! We took a break, and everyone got a virgin daiquiri or pina colada. Sitting with our feet in the pool, smiling at each other and chatting made the perfect family photo! Prints. Although many home printers have the ability to print color photos, they may not be of archival quality and can begin to fade over time. Having this part done professionally may result in better quality and longer life of the photos. If you are printing a large number of copies, this makes more economical sense as well. It doesn't take much to upload your photos to an online service such as Costco or Shutterfly to finish off your project. When you look back over your family photos taken through the years, it really is amazing how quickly your family changes. I hope these tips will save you time, and more importantly, help you document special moments in your family's life.